This is the first design of the serie “Deruta by GPA” inspired by old maiolica/pottery designs of Deruta art. Deruta is a beautiful old town of Umbria, Italy, full of history and art. We strongly advise you to pay a visit to this town. You’ll be enchanted…. 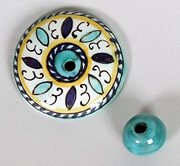 Each maiolica/pottery button and bead is unique since it is handmade and painted only for Giulia Punti Antichi by Le Antiche Fuseruole. For this reason your “Deruta embroidery” is a unique piece of art. 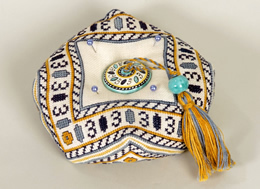 D1 kit: Flat button 03B and Small light blue Fuseruola (pottery bead) by “Academy of Deruta Work”.